The Alternative Models of Ownership report, launched in June 2017, days after the general election, was commissioned by shadow chancellor John McDonnell. Although it is not, in itself, official Labour Party policy, many of the points in it were reflected in the popular 2017 election manifesto. The report starts by stating, "The predominance of private property ownership has led to a lack of long-term investment and declining rates of productivity, undermined democracy, left regions of the country economically forgotten and contributed to increasing levels of inequality and financial insecurity. Alternative measures of ownership can fundamentally address these problems." And it concludes by declaring their goal as, "nothing other than the creation of an economy which is fairer, more democratic and more sustainable; that would overturn the hierarchies of power in our economy, placing those who create the real wealth in charge; that would end decades of under-investment and wasted potential by tearing down the vested interests that hold this country back. The historic name for that society is socialism, and that is Labour's goal." The report is one more indication of the positive break with the Blairite era represented by Jeremy Corbyn's leadership. Berating the report the pro-capitalist blog CapX demanded investors: "ask yourself this question: would Tony Blair, Gordon Brown or Peter Mandelson have ever let this collection of far-left proposals be published as a Labour Party document when they were in charge?" The answer, of course, is no. Under Tory governments Britain has led the world when it comes to privatisation. Of the total value of assets privatised in the world's biggest economies (the OECD) between 1980 and 1996 40% was in the UK. When New Labour came to power in 1997, however, they didn't set out to reverse the fire sale of public assets, but instead continued it. Under New Labour the role of the private sector in the NHS and education increased enormously. British Nuclear Fuel and the National Air Traffic Control service were privatised outright, and the preparatory work was done for the privatisation of Royal Mail (which was then completed by the Tories). Today, the Blairite pro-capitalist wing of the Labour Party still makes up a majority of the Parliamentary Labour Party and will do everything it can to prevent the implementation of any policies - including some of those in 'Alternative Models' - that will threaten the interests of the capitalist class. There are many positives in 'Alternative Models'. When talking about 'national ownership', for example, it emphasises that it "has historically tended to be too centralised, with power in the hands of a private and corporate elite. "To improve national ownership in the UK requires taking measures to increase the democratic accountability of state ownership." Today, millions of workers look back to the post-war era, with its larger public sector, as a golden era. Nonetheless, it should not be a model for the future. Companies that the bosses had brought to bankruptcy were taken over by the state, with the bosses paid lavish overcompensation. They were then run on a bureaucratic model with pro-capitalist management, often former owners and managers, installed. Publicly-owned companies in the future should instead be run under democratic workers' control and management, based on elected committees including service users and representatives of the trade union movement in each workplace, the trade unions nationally, and to a government representing working class interests as a whole. 'Alternative Models' also makes good points about how new technology is currently used to throw workers on the scrapheap, when instead it should be used improve society for all, for example with shorter working hours. But despite the positive aspects of 'Alternative Models', it has a serious weakness. It assumes the capitalist elite in Britain will acquiesce to its proposals and therefore has no plans to counter their sabotage. Yet all the evidence suggests that the capitalist class in Britain is terrified of a Corbyn government and will do all it can to try and prevent it being elected and, if it is, implementing a radical programme. Look at how Labour overtaking the Tories in the polls over recent weeks has led to a renewed frenzy of attacks on Corbyn by the right wing media and the Blairites - yet this is as nothing to what they would do to try and undermine him if he wins a general election. John McDonnell has suggested it will be possible to win much of big business and the city to Labour's programme. However, big business has responded to this very clearly and very negatively. Carolyn Fairbairn, director-general of the CBI bosses' club, has repeatedly urged Labour to abandon its: "vision of significant state intervention including nationalisation, PFI and government procurement". The CBI has been particularly vehement against proposals to reverse privatisation in the NHS, saying 'investors would run for the hills'. Over the coming two decades around £200 billion is due to be paid out of the public sector to private companies involved in PFI schemes. The corporations that have bled our public sector dry will not easily give that money up. It would be naive to imagine that the enormous pressure to capitulate and accept austerity which was exerted on the Syriza government in Greece, not least by the International Monetary Fund, would not be repeated if a Corbyn-led government came to power in Britain. On the contrary, it would face a situation comparable to the experience of the 1981 French Socialist Party government led by President Mitterrand. Swept to power on a wave of enthusiasm, the Mitterrand government's programme included a 10% increase in the minimum wage, the introduction of a 39-hour week, increased pensions, and nationalisation of a number of major corporations and banks. Initially a number of these reforms were implemented, but the government came under wholesale attack from French and international capitalism and from the markets. After only a hundred days in office, the government went into reverse. In June 1982 a freeze on wages was introduced and public spending was cut by 20 million francs as a part of a general turn to what today would be called austerity. In Britain from 1974-76, when the Harold Wilson Labour government, far more modestly than Mitterrand, just attempted to increase taxation on the major corporations, the capitalist class conducted a huge campaign against it, including threatening a strike of capital. The result was the proposal being watered down so far it was effectively annulled. However, far from putting forward a programme to defeat such sabotage, 'Alternative Models' suggests that the capitalist class are sympathetic to Labour's programme. It points to how "around the world, countries are now rejecting privatisation" and argues that: "This is creating the space for a range of alternative models of ownership." No concrete examples are given of countries rejecting privatisation. There is growing opposition to privatisation among the working and middle class people in many countries, as indicated by the popularity of left figures from Bernie Sanders in the US to Corbyn in Britain. It is a very different story when it comes to the capitalist classes of the US and Europe, who continue to favour privatisation. In 2017 alone, five countries received recommendations from the EU to privatise state-owned companies. In Britain, despite the gigantic scale of privatisation that has already taken place, further chunks of the public sector, particularly of the NHS, continue to pass into private hands. Where such measures are prevented it is only as a result of determined struggle by workers and service users. McDonnell has also repeatedly insisted that the nationalisation that Labour is proposing will be 'free' because the government will be buying an asset. The price, he has suggested, would be decided by parliament. It is absolutely clear, however, that the owners of the private companies will try to sabotage that plan, including by demanding the highest possible price. They have already suggested that it would cost £90 billion to nationalise the water companies! It is easy to imagine them fighting a Corbyn-led government for years through the courts to try and delay nationalisation while bumping up their price. These vultures have made a fortune from our public utilities. In 2013 alone, for example, The 19 water firms made profits of more than £2.05billion, handed out £1.86billion to shareholders but paid just £74million in tax. Seven of them paid no corporation tax at all.The way to answer their sabotage would be immediate nationalisation with no compensation to the fat cats, but only to small shareholders on the basis of proven need. The same goes for the railways. Corbyn has said the railway companies will be nationalised when the franchises come up for renewal. However, the normal length for the franchises to run is seven years. This would mean that, even after five years of a Corbyn-led government, some companies will still be in private hands. Of course it is true that the capitalist class are not opposed to nationalisation in all circumstances. 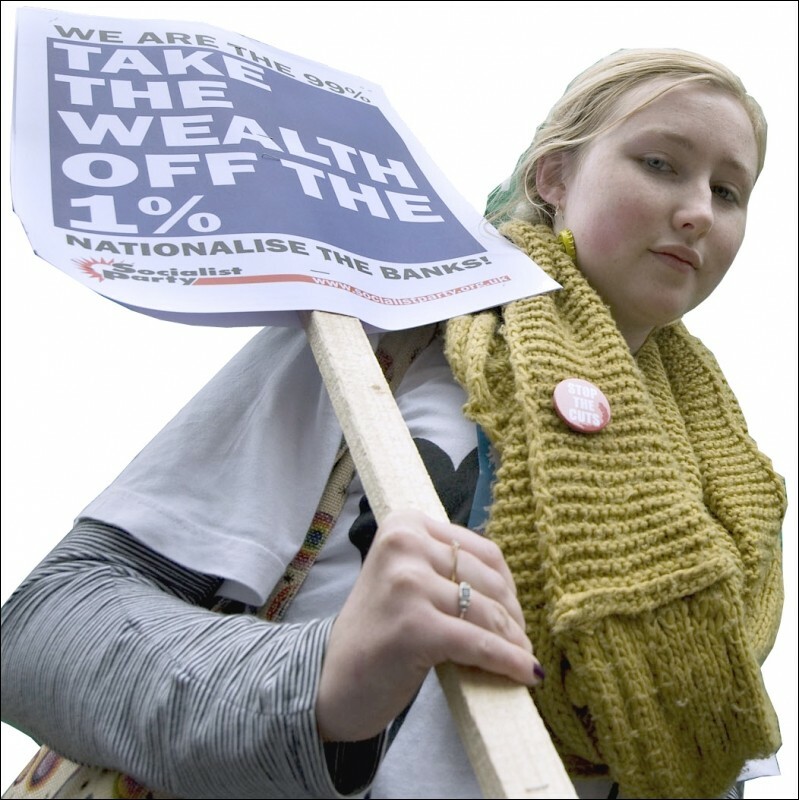 In the wake of the 2008 economic crisis, governments in a whole series of countries - starting with Britain - stepped in to underpin or nationalise banks in order to prevent the economic meltdown that would have resulted from their collapse. This, however, was a totally different thing to nationalisation in order to build a society for the many not the few. On the contrary it was nationalisation to save the fortunes of the few while the rest of us paid for the economic crisis with a decade of austerity. There was virtually no punishment for the bankers who had triggered the crisis - not one was jailed! Fred 'the shred' Goodwin had his knighthood removed, but was allowed to retire with a £16 million pension - hardly punishment! And the banks continued to be run on a big business model - it was socialism for the rich not the working class majority. Far from starting a trend towards ending privatisation the Tories are moving to try and put the banks back into private hands at the earliest opportunity. As 'Alternative Models' recognises, the banks are currently only willing to invest if they can make a quick buck, and it is therefore often difficult for small businesses and cooperatives to gain access to financial support. Cooperatives are given considerable weight in the document, and are put forward as a possible 'alternative model'. This idea is badly undermined however when it says that the "jury is still out" on whether John Lewis is a worker cooperative! Tell that to the staff who were paid below the minimum wage for six years and who have no union recognition. Nonetheless, there may be circumstances where genuine worker cooperatives could play a positive role. However, while it recognises the difficulty in cooperatives and other small businesses gaining access to finance, 'Alternative Models' does not come up with a convincing solution. McDonnell has put forward the idea of a national investment bank to provide finance for investment. He has pledged that the government would put up £250 billion over 10 years, and would attract another £250 billion from the private sector. This will be welcomed by many, but to have any significant effect, British capitalism would have to be willing to start investing. Yet, over the last decade rates of investment have been at historical lows - not because the capitalist class have no cash - but because they prefer to sit on it than to invest it, lacking confidence that they could make fat enough profits from doing so. This is a condemnation of modern capitalism, which no longer carries out its historical role of developing science, technique and industry. Even before the economic crisis, when profits were at an all-time high, levels of investment remained low. The way forward would be for a Jeremy Corbyn-led Labour government to nationalise the banking and finance industry, under the democratic control of workers and users. This would provide the credit required to develop all socially-useful sectors of the economy. Unfortunately, however, Corbyn and McDonnell have not proposed this, instead going out of their way to reassure the City that they will not even bring the Bank of England back under government control instead leaving it as 'independent' - that is private. But this leaves enormous power in the hands of the banks and finance sector to not only continue to refuse to invest in cooperatives and other small businesses that 'Alternative Models' favours, but also to actively sabotage Corbyn's programme. Does this mean that a programme to create a society for the many not the few is utopian? Not at all! But it would be necessary to go further than 'Alternative Models' does. Alongside nationalisation of the banks and finance houses there would also have to be capital controls to prevent any flight of capital. Beyond that the only way to stop the endless sabotage of the capitalist class would be nationalisation of the small number of giant corporations that dominate our economy. The FTSE 100 accounts for 81% of market capitalisation in Britain. Nationalising them would lay the basis for a democratic plan of production run by elected representatives of the workers and the wider community. On this basis it would be possible to harness the new technology created by capitalism, not to increase exploitation of the working class, but to build a society that met the needs of all. Any government carrying out such a policy would need to mobilise the working class in support of its policies and to have an international perspective, collaborating with the workers' movement in other countries to develop socialist planning at an international level. However, in a globalised world, the enormous similarities between the struggles facing the working class in different countries mean that such a government would have a very immediate and widespread resonance. A socialist government in any country of Europe that acted to break with capitalism would immediately receive enormous support from workers across the continent, above all in those hardest hit by austerity. Hannah Sell will be a keynote speaker at Socialism 2018. This weekend event will provide the opportunity to discuss and debate these questions of public ownership, the civil war within the Labour Party, how can socialism be achieved and much, much more. 20% discount on tickets available now!